Welcome to the Athletic Union League Division 2A (Saturday), where alongside Palmerston play such renowned teams as Inchicore Athletic, Green Park* and the two Uniteds of Ballydun and Baldoyle. "The League has decided to send out Match Observers to all Premier A and Premier B games due to the level of abuse coming from the touchline. Any club official or club whose supporters are found guilty of abusing a Referee will be dealt with very severely. You have been warned". Those especially observant (or truly mad) may recognise this gentleman, while a few more of you probably can't quite place the name. It was Kevin Keegan who was first alerted to the potential of striker Eatock, and he paid £25,000 to the Magpies of Chorley for the 20 year old in late 1996, the final transfer he was to broker for United. We also played a friendly at Victory Park as part of the deal. 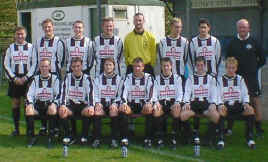 The former Wigan trainee then became a mainstay of the reformed Newcastle reserve side in season 1997/98, as they gained promotion from Pontin's League Division 3, only to then be handed a place in the new Premier Reserve league. However Eatock suffered a serious knee injury which curtailed his appearances, and left United in October 1999 on a free. He returned to the non-league scene after a brief spell with Brentford and appeared for Kingstonian before returning to his native North West where he played for Leigh, Northwich and Lancaster. Finally he resigned for Chorley on the eve of the 2000/01 season and has been there ever since, completing a century of appearances for them recently. He's one of two Eatocks at Chorley, his brother Paul provided occasional goalkeeping cover. 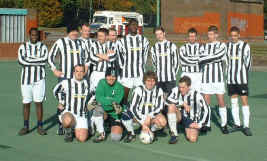 The phrase motley crew springs to mind but pictured above is the Sports Interactive XI based in Islington, North London. On the far right of the picture is Morpeth-born Toon fan and NUFC.com regular, Grant Appleyard. We suspect the burger van lurking in the background is actually the team bus, judging by the physique of some squad members. And we know who ate all the pies, eh Mr Woolly Hat?? A typical Saturday morning, and while many of us are on the road to wherever the Mags are playing or shivering by some touchline watching the juniors, a fair few are tuning in to Skysports for their "Soccer AM" show. Despite being hosted by Chelsea/Torquay fans and featuring non-celebrity guests like Neil Ruddock, "AM" remains consistently entertaining and amusing. And, in the case of the Brian Kilcline arm-wrestling challenge, frankly bizarre. So, what has this got to do with TAPIBAW? Well for reasons too obvious to mention, the Soccer AM football team aka "The Badgers" play in the hallowed stripes when they manage to organise themselves. As well as featuring the dubious talents of presenters and crew, a number of ex-pro's also get drafted in, including former toon boys Peter Jackson and Alan Kennedy. Most of their fixtures tend to be in the south of the country, but an excursion up to Blyth Spartans in 1999 yielded a 4-1 victory to the Badgers. And with buoyant youth and reserve teams providing the bulk of the senior squad, things are looking good for the side, despite the loss of the man dubbed: "the David Beckham of Oxfordshire football as far as long-range free-kicks are concerned" by a star-struck local reporter. That man is striker Scott Taylor, a member of the RAF Representative side and a Senior Aircraftsman who was formerly based at nearby Brize Norton.